Property Size 1,425 sq. 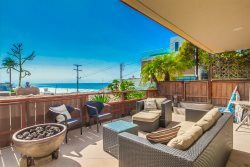 ft.
Best ocean views in Solana Beach. Nice breeze and blue skies will make any vacation perfect! Two Bedroom, Two bath Condo located in the heart of Solana Beach close to resturants, shopping, and entertainment. This complex features a pool, hot tub, and tennis courts. Two dedicated parking spaces, club house and an elevator.